Bruising refers to bruises – darkish black and blue marks on the skin that are usually formed without a cut. Typically, the first discolorations of bruises are black and blue. Then, when the hemoglobin of the blood breaks down, the color turns to yellow. Bruises are also associated with some swelling and surrounding redness of the tissues. Bruising occurs due to blood that leaks out of capillaries, generally after an injury, and collects just beneath the surface of the skin. 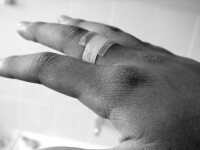 Bruising is more common in children, primarily as a result of accidents. Bruising also occurs more frequently in women than in men, which may be due to the estrogen demands of vitamin C on the body. Bruises that do not fade after a week, or are recurrent without cause, may be signs of bleeding disorders or vitamin C and bioflavonoid deficiencies. Or they could be signs of underlying stresses on the body that continually deplete the vitamin C stores. In such cases, it is important that you see your physician. Eat a whole foods diet that emphasizes foods rich in vitamin C and bioflavonoids, such as fresh fruits, buckwheat and green leafy vegetables, the latter of which are also rich in vitamin K which plays an important role in reducing bruising. Eat fresh pineapple, it contains bromelain, an enzyme which help clear the body of metabolic waste from injuries. Avoid conventional beef. The best beef is organic grass fed beef. The second best is organic meat; this includes beef, veal, lamb, chicken and turkey.Check out www.grasslandbeef.com. Bilberry extract is good for strengthening capillaries.